London isn’t the first place you’d think of to seek out wild herbs and plants, but if you know where to look there’s plenty of them. 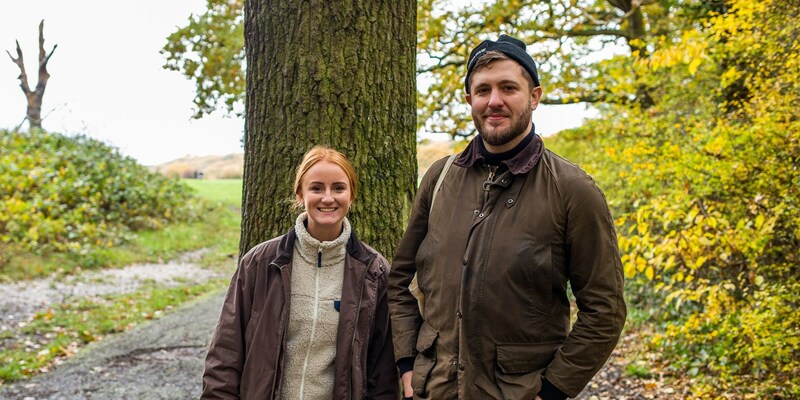 Tom Shingler spends a day with Ivan Tisdall-Downes and Imogen Davis – founders of foraging-focused restaurant Native – to discover a world of flavour growing in the greener parts of the capital. There’s a serious romanticism when it comes to romping through the British countryside, picking at hedgerows and harvesting herbs brimming with fresh flavours. However, thinking about how lovely foraging would be and actually doing it can be quite different. There’s the uncertainty that whatever you’ve found is even edible (some things will even put you at risk of death – particularly mushrooms). It can be hard to train your eye to see the difference between all those blades of grass and a tiny leaf. Sometimes you’ll spend hours peering at the ground and come away with nothing. That’s why I’ve never ventured beyond picking the usual suspects on walks – easy things like blackberries, sloes and wild garlic. So when I was invited to spend a morning foraging in a secret location in south east London with Ivan Tisdall-Downes and Imogen Davis – the owners of Native near London Bridge – I jumped at the chance. Native has been making waves in the London restaurant scene for a few years now, showcasing foraged British ingredients and bringing a zero-waste approach to cooking. After closing in Covent Garden (due to a restaurant licence being revoked) it reopened near London Bridge in the summer of 2018, expanding the dining room from twenty-five covers to sixty. At first, you might write off the whole foraged thing as a bit of a gimmick – many a chef has fallen prone to putting a foraged herb of some kind on the menu simply because it sounds trendy, despite tasting pretty uninspiring – but only the things that really taste amazing make it onto the dishes at Native. A couple of metres away from our sorrel discovery was one of the most surprising things I tasted during the whole morning – a tiny patch of vetch. At first I couldn’t distinguish it from the grass, but on closer inspection they were there: tiny leaves with little curled tips. To me, it looked like any other small green plant, but Ivan and Imogen excitedly talked about how it has a flavour almost indistinguishable from fresh peas. I tasted a little sprig and they were right – it was exactly like a pea shoot, growing wild right there in amongst the damp grass below our feet. Apparently when it’s a little warmer they will produce beautiful little edible purple flowers, and even grow little pods to boot. These three ingredients – hogseed, sorrel and vetch – were perfect examples of the range of flavours to be found in the British countryside. The fact that we found them all within an hour of walking through a bit of greenery in London suggests that there’s even more to be found outside the city, and if you know what you’re looking for a quick stroll can become very bountiful indeed. To demonstrate this, Ivan and Imogen laid out a picnic highlighting some of their favourite wild ingredients. There was a fougasse bread flavoured with charlock seeds (a sort of wild mustard) which we stuffed with foraged confit mushrooms with a little cured egg yolk on top. There was a damson syrup used like a cordial to flavour water. There were some incredible jelly-like wood ear mushrooms coated in dark chocolate which tasted an awful lot like Turkish delight. The highlight, however, had to be a gorse panna cotta – it had such a pronounced vanilla flavour, yet there wasn’t a trace of vanilla in them. It’s this that makes Native such a success. Rather than putting foraged ingredients front and centre, they’re subtly added to dishes to season or highlight other flavours we know and love. Alexander seeds are used to add tang to a butterscotch sauce, for instance, while slightly bitter herbs are infused into stock syrups to be used in cocktails and other foraged plants are dehydrated, preserved or powdered to be used as a seasoning. After all, you could put all the weird and wonderful herbs in the world into a dish – but just because they’re edible doesn’t mean they always taste good in their natural state. Sustainability is obviously important to Ivan and Imogen, as is their zero-waste approach to running Native. As well as getting in whole animals, using foraged ingredients to take the strain off the food chain and working with farmers and suppliers who follow the highest ethical standards, they ensure as little as possible goes in the bin. They’ve become well-known for their ‘Chefs Wasting Snacks’ – a trio of little bites that are made from the trimmings and peels generated from preparing other dishes on the menu. They hope one day to open a sister restaurant to Native in the countryside, acting as a sort of community hub and working farm, and are looking at setting up a vertical farm in London to create a new form of farm-to-table dining. As we make our way back into the greyer parts of central London, it was hard not to be inspired by Imogen and Ivan’s passion for all things sustainable and foraged. Running Native means they don’t get as many chances to go out and forage as they used to – instead, they work with as many full-time foragers as they can. But whenever they have the chance they’ll venture out into the countryside – usually Sussex or Northamptonshire – and spend an afternoon just seeing what they can find. Since our trip my usual brisk walks with the dog have turned into slow-paced treks with my eyes set firmly on the ground, hoping to spot a patch of vetch or an elusive sorrel leaf. And while all I usually see is grass and things I’m far too inexperienced to actually identify (let alone dare to taste), I’m hoping one day I’ll be able to bring something home and cook with it. For now, however, I’ll leave it to the team at Native – after all, they are well-versed in taking these fascinating ingredients and turning them into seriously tasty food.